Today’s cringe-worthy subject line comes to you compliments of the yarn being used. The shade is called ‘Pegasus‘, so yanno, wings, har har. I couldn’t resist it though, because besides being a pretty colourway, my high school mascot was the Pegasus. Well, my home town had a thing with Pegai in general..
Anyways! 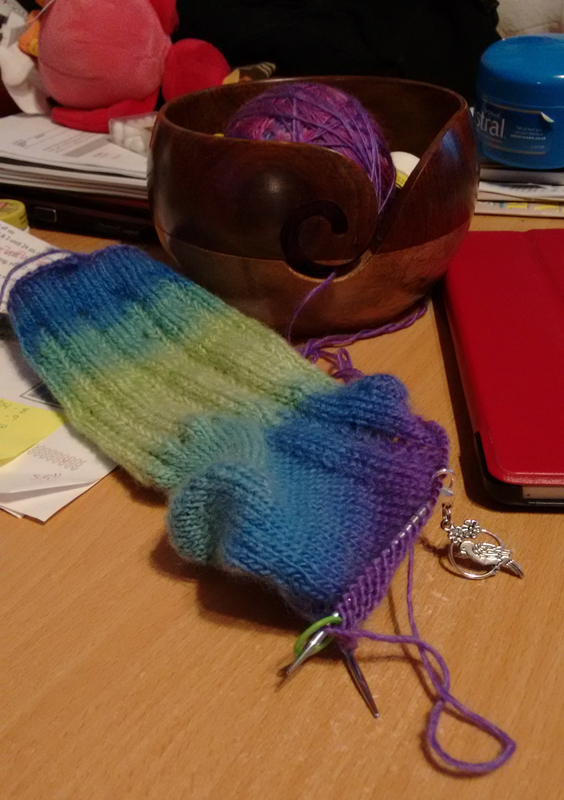 tl;dr, it’s a pretty colourway, I’m sentimental, and lookit my sock. I’ve not done anything with it yet today besides pick it up and look at it, ’cause yanno, work and kids. It’s nice to be slowly catching up, and I can hope that the time spent in the office tomorrow is also productive. My misanthrope comes out in a big way when thinking about going into work, but for the most part our basement office is the right enough balance of quiet and noise that my anxiety is manageable and I’m best able to focus. Really, it’s only particularly bad if two people are on the phone at the same time, but since *I’m* not the one having to use the phone… I can tough it out for a few minutes, ha ha. And why must I enter the land of people tomorrow? Well, Z has a consultancy appointment for a minor surgery, so we’re going to that, and then heading into work. I just hope my brain remembers first thing in the morning so that I’m down promptly and not holding up the party. It should be fine — it usually remembers these things. For now, I should wrap this up ’cause I’ve got kiddos to herd. Z has a work meeting, so I’ve got solo bedtime duty. Hopefully I won’t wind them up too much; I have a bad habit of getting all tickly and giggly with them. And then I get a bit of that precious, all to myself, introvert party time. Ooooh yes, I’m going to knit and game so hard.